Family Day findings show high birthrate in Judea and Samaria, increase in number of single-parent households. 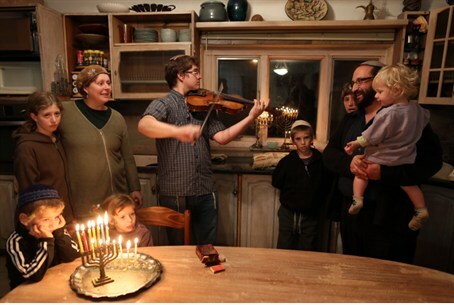 The Central Bureau of Statistics published data about family life in Israel on Wednesday in honor of Family Day. There were 1.83 million families in Israel in 2011, compared to 1.5 million in 2000. Of the families 1.47 million were Jewish and 310,000 were Arab. Jewish families included 3.5 people on average. About half of the families consisted of two parents and children under the age of 18. In Judea and Samaria the average family size was 4.7 people, an indication of the region’s birthrate, which remains the highest in the country. In Jerusalem the average family size was 4.2, and in northern Israel, 4.1. The smallest families were found in the Tel Aviv region, where the average family had 3.2 members. The Tel Aviv area had the lowest percent of families with children, 37.5%, and the highest percent of families consisting of married couples with no children (34.4%). The data showed that the number of Israeli households headed by a single parent has risen, but the percent of single-parent households remains roughly the same. There were 107,000 single-parent households in 2011, making up 6% of the total families, compared to 89,000 single-parent households in 2000. The Jerusalem region and southern Israel had the highest percent of single-parent households, with such families constituting 7.4% and 7.0% respectively of families in the region. Among Israel’s major cities Petach Tikva had the lowest relative number of single-parent families, while Haifa had the highest. While housing prices have increased significantly over the past decade, the CBS data revealed that Israelis are living in less cramped conditions now than 10 years ago. In 2011, 52.8% of families lived in housing units with more than one room per person, compared to 48.7% in 2001. The average family spends 13,967 shekels a month. Families with children spent, on average, 1.3 times more than families with no children under age 18. Families with minor children spent twice as much on education and entertainment (2,367 shekels per month compared to 1,166), and were also significantly more likely to own a car.